You know, I haven’t played a good game of D&D in years. This shows promise, but I choose to reserve judgement until I’ve had a chance to check it out. Wizards of the Coast and SmiteWorks today announced the launch of Dungeons & Dragons content in Fantasy Grounds, the online virtual tabletop. Fantasy Grounds is an application developed by SmiteWorks to help gamers play tabletop role playing games over the internet. 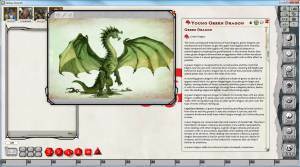 D&D fans can now play D&D adventures online inside Fantasy Grounds by purchasing and downloading the virtual tabletop via the Fantasy Grounds website or on Steam. All of the rules, classes and monsters available in the core rulebooks has been converted to be usable within Fantasy Grounds. Got some new author resources for y’all. So I’ve had more time to search around in my continued journey for the best ways to promote your works while keeping your money in your pocket book. Being a man who lives under the poverty line, I know how hard it can be to get everything you want/need let alone to find money to do promotions or things of that nature. So I’m going to take the chance to list a few new relatively cheap resources I’ve found on my journey that can help you in the long run. A new book listing site with an innovative attempt to give equal opportunity to independent authors. They offer it as a free service for now, but are planning to go to a $5 a year subscription model in the future. I do a lot of shameless promotion, and this may be one of those times, but at the same time I have had a lot of great interactions with other authors on this board. Helpful and full of lively conversations, Ann, BB, and VM help me to keep this place reasonably clean. I had a long hard debate with myself, to automate anything on twitter, or to keep it all me. After trying this site out for a day, some things can afford to be automated. Now I don’t feel like a complete jerkoff as I type up a tweet to promote myself, I can just let the program do it for me! Set up a prearranged pattern of tweets, and it’ll do the rest! Just remember to modify the times it tweets, you don’t want it going off every 10 minutes….people will not be happy if you do. A very effective tool for creating good hooks for your books. Great for the blurb that goes on the back. The higher your score, the better it will connect with potential readers! I must admit, I haven’t used this service, but I have heard decent things about it. If you’re a new author, looking to get your feet wet with marketing, these guys aren’t a bad way to go. Editor association, good place to list a work you would like to have help with, though they aren’t that budget friendly. Reasonably priced editing. Though I haven’t used her service myself, I’ve heard positive things from others that have. I know, I’ve shared this one before, but they really are an awesome resource for authors on twitter. And she will tweet for you! Just send her a message you’d like put out, and she’ll do it within a day or two. Awesome, awesome resource. Can’t stress enough how much they help. I haven’t used this service, but I included it on the list because they’re having a spring sale. $140 for a full edit, that’s a good price. But she has only a few slots left, so don’t wait. Alright, that’s enough for today. Took me an hour just to find all this stuff it’s so spread out! But we authors need all the help we can get, and these all do just that.